Marissa Honda is a passionate performer, professor, and music advocate living in Los Angeles, CA. She has performed and taught music in regions of the Philippines, Switzerland, Canada, the Middle East and throughout the US. She has performed with orchestras including the Los Angeles Philharmonic, Santa Barbara Symphony, New West Symphony, Pasadena Symphony and Riverside Philharmonic Orchestra. 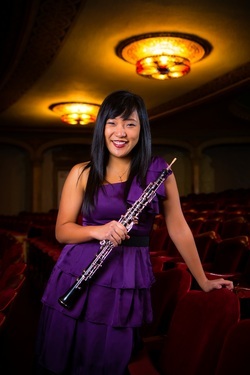 In 2014, she won the English Horn position with the Fresno Philharmonic Orchestra and received tenure in 2016 under music director Rei Hotoda. Passionate about music’s social and educational purposes, Marissa is an engaged music educator. Marissa is professor of oboe and Music Teaching and Learning at The Master's University in Santa Clarita, CA, professor of oboe at Citrus College in Glendora, CA and Mt. San Antonio College in Walnut, CA. She is an active online professor, designing and teaching a fully-online Music Fundamentals course for Fresno City College in Fresno, CA. Most recently, she was invited to present her paper on Building a Resilient Musical Identity for the International Society for Music Education Global Conference in Baku, Azerbajian in July 2018 as well as the College Music Society Conference in Vancouver in October 2018. In 2017, she traveled to Manila, Philippines with MusAid Organization working with students in an el sistema orchestra program called Ang Misyon. While in school at USC, she received the Thornton Outreach Program Award in 2013 and upon finishing her DMA in Oboe Performance in 2017 was awarded the Music Teaching and Learning Departmental award. She maintains a private oboe studio in Los Angeles and since 2014, has been an oboe faculty member at Bocal Majority/Operation OBOE oboe and bassoon camp at Pepperdine University. As an advocate for new music, she is currently working on a solo recording project featuring music newly arranged and composed for the English horn, recorded at Hollywood’s Capitol Records recording studios to be released in 2018. She commissioned Mike Dana’s “Lily, Dancing on the Wind” for oboe, trumpet and piano as a part of a special homecoming duo recital and outreach project at Fresno City College in Fresno, Ca in June 2013. In summer 2012, she premiered Molly Joyce’s Vintage for woodwind quintet as part of the Imani Winds Chamber Music Festival at the Juilliard School in New York. In April 2012, she premiered Daníel Bjarnason’s The isle is full of noises at the Walt Disney Concert Hall with the American Youth Symphony. Marissa works as a recording musician for film scoring projects throughout Los Angeles. She holds a Bachelors of Music degree from USC in Oboe Performance with a minor in communications, and a Masters of Music degree in Oboe Performance from USC. In 2017, she completed a Doctor of Musical Arts degree at USC in oboe performance, Music Teaching and Learning, Arts Leadership and Instrumental Conducting. Her primary teachers include Marion Kuszyk, Joel Timm, David Weiss, Allan Vogel and Rachel Aldrich. She has spent summers performing at the National Orchestral Institute, the Atlantic Music Festival, the Idyllwild Summer Arts Festival, the Lake George Music Festival Orchestra and others. In 2014, Marissa performed Copland’s Quiet City as English horn soloist with the American Youth Symphony. Marissa has won the Fresno Musical Club Bell T. Richie Award for Advanced Musicians, the Fresno Youth Symphony Concerto Competition, and has been featured on KVPR Young Artists Spotlight. She can periodically be seen as an on screen musician for the FOX TV series GLEE.